If you live in a region prone to snow, freezing rain and cold climates you should consider investing in a set of winter tires. Winter tires are made to maintain more efficient traction in extreme cold, and on icy, snowy or slushy roads. The rubber is crafted to be more flexible on winter tires, allowing for the tread to conform to the road better in extremely cold conditions. Their specialized tread designs along with a variety of other features warrant them ideal for inclement weather and extreme cold driving conditions. *Our maintenance tips apply to both All-Season and Winter Tires alike. Some tires wear out quicker than others, there are various qualities that determine how long your tires will last. It’s important to check your tires frequently to ensure your safety. 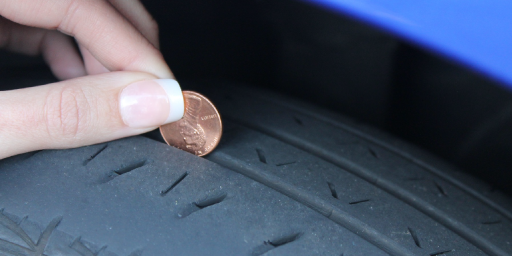 If you aren’t familiar with tread wear indicators, try using the good old-fashioned penny trick! Place a penny in one of the grooves with Lincoln’s head facing down. If you can see all of Lincoln’s head, your tread depth is less than 2/32 inch and you need to replace the tire. Cold weather has a stronger impact on your tire pressure opposed to any other season. Keep an eye on this by gauging the pressure at least once a month; once a week if you drive through a lot of mileage. Inflate the tire according to the PSI requirement for your vehicle. You can usually find your PSI level in your owner’s manual or on a specific label inside of the driver’s door frame. Balance your tires every 6,000 mi to prevent uneven tread wear. Experts say directional tires must be rotated on the same side of the vehicle (front-rear), while non-directional tires must be rotated to form an X (ex. : front right to rear left). It is recommended to re-align your tires if your vehicle begins to pull to the left or the right. Driving through snow and ice is often a dangerous venture, checking your tires before the weather gets worse is one of many ways to protect yourself from the dangerous driving conditions. Ask your local Rockford Mutual Agent about our Roadside Assistance Program to ensure you’ve always got someone to rely on when the weather gets rough!